For a movie about developing the greatest energy source in the universe, “Max Steel” is surprisingly bland, and it comes limping quietly into theaters without being shown to critics before opening day. Based on the Mattel line of games and toys, “Max Steel” serves as an origin story clearly aimed at tweens and teens with hopes of launching the next big sci-fi/action franchise. But it’s borderline incomprehensible regardless of your age. Director Stewart Hendler, working from a script by Christopher Yost, serves up a series of noisy, murky set pieces that grow repetitive visually and tonally. At the same time, though, the actual nuts and bolts of the story become increasingly confusing, leading to a spectacular conclusion that’s unintentionally hilarious. The Orlando Bloom-esque Ben Winchell stars as Max McGrath, a shy 16-year-old who’s sick of moving from town to town with his widowed mother, Molly (Maria Bello, whose mere presence is the only reason this movie gets half a star). At the film’s start, the two have just come back to the hometown of his late father (Mike Doyle, seen in flashbacks), a scientist who died long ago in a mysterious, explosive accident. Dad’s former partner, Miles (Andy Garcia, hamming it up big-time), who’s now in charge of the company the two built together, arrives soon afterward to help them get settled. In no time, Max starts discovering that weird things are happening in his body—like, he can shoot blue-tinted streaks of liquid energy from his fingertips. Appliances start malfunctioning when he’s around, and sometimes he just straight-up blows things up by accident, like a boom box or a lamp. Steel trains Max to control his newfound powers in an abandoned factory where he has plenty of room to do flips and tricks off beams and ledges. It’s like Kevin Bacon’s angry dance in “Footloose,” only not nearly as entertaining. Once Max is feeling confident, Steel shows him what they can achieve when they physically join forces. When they do, they become a superhero known as … wait for it … MAX STEEL, complete with head-to-toe body armor, super strength, flying abilities and a chest beaming with energy. He’s essentially Iron Teen—without the benefit of clever, witty quips. If only it were that simple, though. 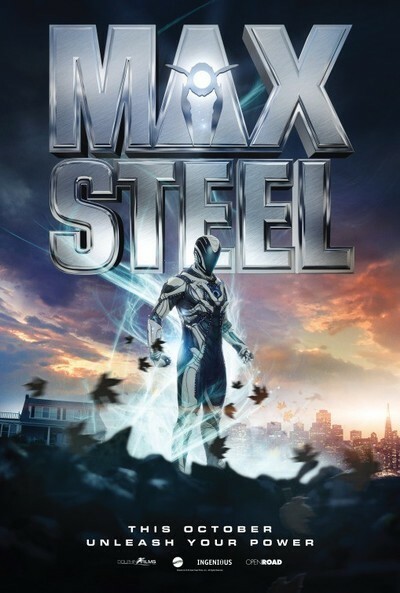 Armed bad guys are after Max (and Steel, and Max Steel) to capture them and harness their energy. There’s also a giant, tornado-like creature with a mean face and glowing red eyes, which might also be an alien … ? As if those nuisances weren’t bad enough, Max suffers chronic, debilitating headaches from all the energy pulsating through his body, and the force of his chest bursts burns patterns on his T-shirts that are uglier than the worst Ed Hardy designs. Thankfully, he meets the one nice girl in town who’s willing to tolerate Max’s erratic behavior: Sofia (Ana Villafañe), who’s not only smart, beautiful and outgoing, she also knows how to fix bikes. She’s Manic Pixie Dream Girl-adjacent. Anyway, after a series of similarly shot and paced chase scenes and a whole lot of scientific gobbledygook, there’s a big showdown between Max in his fancy suit and another character in a fancy suit (we wouldn’t dream of telling you who) which is meant to be dramatic and tense but ends up being laughably silly. Hendler repeatedly cuts away to their faces inside the suits as they strain and grunt and struggle to control each other, to the extent that it’s hard to remember what they’re fighting about.